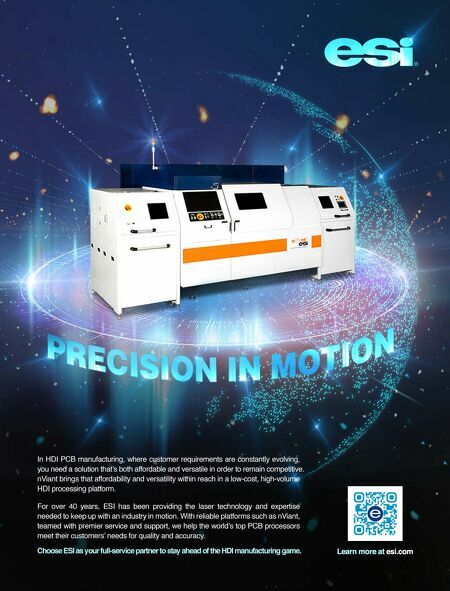 64 The PCB Magazine • December 2016 Introduction In November's column, I articulated the need to provide a quality drilled hole. I stated that a less than optimum mechanically drilled PTH will negatively impact the metallization processes as well as potentially affect the qual- ity of the wave soldering of the PWB. In this month's installment of Trouble in Your Tank, I will further explore the critical drilling param- eters required to drill a "good hole" and provide information on some little-known parameters required for this operation. What is a "good hole?" A good hole is one that has a uniform and smooth sidewall, with no defects outside the tol- erances defined by applicable specifications such as: smear, burrs, nail heading, debris, glass fibers, foreign material inclu - sion, etc. A good hole is drilled accurately with respect to size and location within the speci- fied tolerances, and a hole wall perpendicular to the surface of the PCB. Deep drill gouges, torn-out glass bundles and the potential to create wedge voids severely impact the metalliza- tion process. When drilling is not optimized, many defects can and will occur. Unfortu- nately, if not recognized and corrected early in the PCB fab- rication process, these drilling- induced defects may go unde- tected until the finished PCB has been sent to the assembly process! This is not a scenario you want to deal with. Drilling-Induced Defects One example that has many possible causes is the wedge void or wedging (Figure 1). One must be able to think about the entire fabrica- tion process if wedge void is detected. A weak bond between the resin and copper, along with incomplete cure of the resin are two possible causes. However, excessive heat generated by the drilling process will also contribute. Gener- ally, dull drill bits, excessive in-feed rates, and slow up-feeds contribute to the possibility for wedge voiding or wedging to occur. Table 1 provides a concise overview with the causes and corrective actions when wedge void- ing or wedging is occurring. 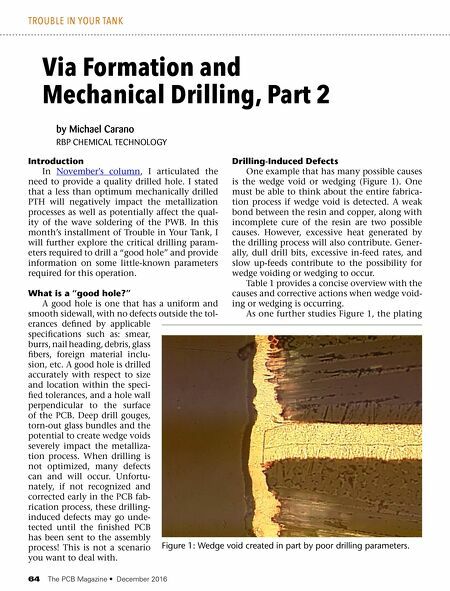 As one further studies Figure 1, the plating by Michael Carano RBP CHEMICAL TECHNOLOGY Via Formation and Mechanical Drilling, Part 2 TROUBLE IN YOUR TANK Figure 1: Wedge void created in part by poor drilling parameters. Column — Are You Getting What You've Asked for?